It is one of the world's biggest castles (some say the largest). 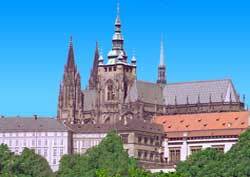 Since the 9th century, Prague Castle has been the seat of kings and presidents. This colossal Gothic structure (see photo) dominates the Prague skyline and is strikingly ornamented inside and out. Many famous kings were crowned and buried in it. The highlight is Vladislav Hall. It is a large, majestically vaulted throne room. Festive events were staged in it including lavish banquets and even Prague style jousting tournaments. This relatively small, thousand year old, Romanesque style basilica is well preserved. Adorned with gems and artwork. A cute row of tiny, colorful buildings nestled against a castle wall - the lane view is quite photogenic. The former inhabitants included goldsmiths and palace guards. Today, tourist shops reign.